There are almost as many definitions for the term, "Value Investing," as there are people using it. No wonder it can be confusing. However the quintessential definition belongs to the way Warren Buffett does it. After all, he's made over $50 Billion doing it his way. So if you're going down the Value Investing road, you may as well follow the man who is most successful. Now most people think that Value Investing is simply buying cheap stocks. Unfortunately there are some serious downsides to simply finding cheap stocks, even fundamentally solid ones, and buying them. First, the market could take a very long time to realize these stocks are undervalued. At the end of the day, it doesn't matter whether you own excellent value if nobody is willing to pay you for that value. This is called the realization-of-value-problem and is a very real concern, for anyone who invests money in the stock market, because the longer it takes the market to realize the true value of a company, the lower the compounded annual returns will be. To see why, let's look at an example where a stock that has an intrinsic value of $10 a share is selling at a discounted $5 per share. If the market realizes the stock's true value in a year, the annualized return will be 100%. If it takes two years, the return will be 41.42%. Three years? 25.99%. Five years will return 14.87% and ten years will give a 7.18% return. As you can see, the differences in annualized returns are significant, and we really don't know when the market will fully value the shares. Another problem is that a company might look attractive at a particular point in time, but a host of intangibles, such as management integrity or government regulation, that weren't reflected in the numbers could cause an excellent business to decline in the future. To guard against this occurrence, Benjamin Graham, Warren Buffett's mentor, would widely diversify, sometimes holding hundreds of stocks in his portfolio. He expected some would not perform well, but believed that the ones that did perform would more than offset the ones that didn't. And he was usually right, as his results often showed. However Buffett soon tired of this way of thinking and started searching for a more efficient way to invest. He famously said that, "wide diversification is only required when investors do not understand what they are doing." This was not a slight at his mentor Graham, who would have agreed with Buffett, because Graham himself had to admit that he did not understand all of the companies he held. There were just too many of them. Buffett eventually found what he was looking for in the works of John Maynard Keynes, Lawrence Bloomberg and Philip Fisher. When he combined their philosophies with Graham's, he arrived at an investment strategy that has served him well over the past five decades. Buffett used Keynes' concept of the concentrated portfolio to focus his investment analysis on areas that he knew very well, and no others. During the Internet technology boom of the late 90s, Buffett refused to participate and was ridiculed by many for missing out on huge profits. However Buffett had the last laugh when the crash inevitably came. To this day Buffett does not invest in technology firms because he says that he doesn't understand their business models. Bloomberg contributed the idea of the consumer monopoly (or economic moat). This is a business that has an extraordinarily high barrier to entry. It could be because of lucrative patents (think pharmaceutical companies), brand (for example, Coke) or a real monopoly (such as Microsoft Windows). Bloomberg determined that such companies should be able to grow their earnings faster, which would lead to higher returns on equity and, eventually, higher share prices. By filtering on this criterion, Buffett was able to eliminate a large number of companies that had higher risks of failing. This one idea allowed Buffett to remove the need to diversify as widely as Graham had because he was relatively certain that the companies he chose had a far greater chance of success. Coupled with Keynes' notion of intimately understanding a company's business model, Buffett was at last able to do away with Graham's need to diversify over hundreds of stocks. Fisher's contribution was the idea of investing only in top-notch businesses and never selling them. This contrasted starkly with Graham's strategy of buying undervalued businesses and then selling them when they reached fair value. 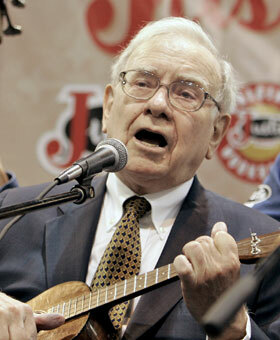 Putting it all together, Buffett now had the seed of his investing strategy. Look for fundamentally solid stocks that represent good value with a built-in margin of safety, invest only in top companies that have a high barrier to entry, only invest in what you know, concentrate your holdings and hold your investments for a very long time. If you'd like to outperform the stock market, then you can do very well following Buffett's method. He's already proved it works, so why not put it to work for you? A professional software developer, Mark Hing has over 20 years of investing experience. For the past 10 years he's been creating powerful, easy-to-use investment software packages based on the enduring principles of Value Investing stalwarts such as Warren Buffett and Benjamin Graham. Mark's best-selling software package is the acclaimed Value Stock Selector. It was designed for investors of all levels to help them find undervalued stocks sporting exceptional fundamentals with just a few mouse clicks.